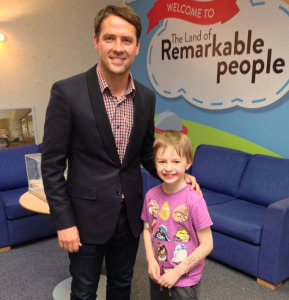 Earlier this year Luke was asked to be a young ambassador for Alder Hey in recognition of all his fundraising for the hospital and cardiac ward in particular. This was such an honour for Luke and us and an incredible way to be able to give back. 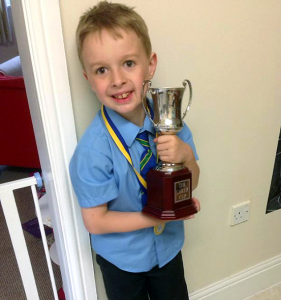 Since birth Luke has been a regular patient at Alder Hey and has had three open heart surgeries as well as many other procedures. He has had some very lengthy stays on the cardiac ward and at times things have been very tough. In his role as young ambassador he attended the topping out party of the new hospital. This was a really important date in the history of the new build as it marked the final stage. We all filed up to the roof of the building where we could see for miles and this in itself was a great sight-seeing how our new hospital is going to be. 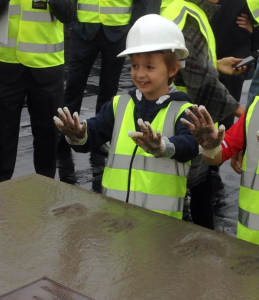 After speeches from some VIPs Luke was invited to cement his handprints into the new building where they will stay forever. His achievements didn’t stop there. After missing almost half of the academic year he was determined to be there for celebration night. This was an achievement in itself but whilst there he was presented with a prestigious award for outstanding achievement whilst overcoming adversity. The roof lifted and there was not a dry eye in the house. Every single parent knew just how incredibly hard he had worked after missing so much time recovering from endocarditis. Another huge achievement took place on a CHA event. The PGL adventure holiday brought the children and parents together where unbreakable bonds were made. At a cardiac appointment the day before we set off for PGL we learnt that Luke’s condition had got much more complicated and that he was now being referred to Great Ormond Street to see what treatment they could offer. I went to the PGL with somewhat a heavy heart but in being surrounded by other parents who understood and could support us made everything seem much better. Luke has always struggled with his mobility and with the recent changes was much less energetic and so I worried how he would find the PGL. All the children started off cautiously but as the weekend went on they became more confident. By the final day the support they gave each other meant that they all tried everything. It was very much a case of we are all in this together. I think we all cried when the children came down the zip wire and I was absolutely gobsmacked that Luke had done it. He got off and said “once in a lifetime is enough” but he did it. We came home from the weekend having made some of our best friends and when Luke was admitted to hospital for 4 weeks the day after we returned they came to visit, helped make the days pass quicker and generally brought a lot of love and support – as well as much need home cooking. So whilst Luke has achieved a lot this year – not forgetting his nominations for a Pride of Britain award – the CHA has also achieved something amazing for us. With Luke due to go to London for major surgery in December we are going knowing we have incredible support. The friendships I have formed with the other mums, and Luke with the children, is very special and I’ll admit we are a crazy bunch. Most of all they understand what we are going through and are always at the end of the phone. Some even have plans to come and visit us, and so suddenly London doesn’t feel that far away. Luke is a different person around his CHA friends. He always feels a bit awkward around his peers and a lot of this is due to having spent a lot of his young life around adults in the hospital opposed to other children. It is also difficult when you can’t keep up with your peers and are always the one struggling or making yourself feel poorly by trying so hard to do what the other boys are doing. Around his CHA friends he can be himself and go at his own pace. Whilst there is a great range of ability amongst them they all have one very special thing in common, and all of us mums have remarked on how they just feel so comfortable around each other. I can relax more when we are all together too as we are all looking out for each other and this is especially true amongst the children. So with a year full of many ups and downs, the ups have made the downs a lot more bearable.